We welcomed to the show for the first time Dr. Zina Jarrahi-Cinker, Executive Director of the National Graphene Association (see https://www.nationalgrapheneassociation.com for more information about this material and its uses). To stay up on graphene news, including how it can and is being used for space applications, subscribe to the free graphene newsletter off the website. During our two segment 90 minute program, our guest, Dr. Jarrahi-Cinker, introduced us to graphene and talked extensively about graphene properties which make it the thinnest and strongest material ever known to man. During this early discussion, you will hear our guest mention the term one atomic layer. I asked her to define this term which she did, then I said that on TSS, we had always had guests saying carbon nanotubes were the strongest material ever. I asked her to substantiate her graphene claims against what many guests and callers have said over the years regarding carbon nanotubes, using the space elevator as an example. Please don't miss this discussion and what our guest said in response to my question. Other first segment topics talking about the various properties, including transparency. For example, at one atomic layer, you cannot visually see the graphene material as it has only 3% absorption. We talked about the 15 year graphene history, how it was discovered, and the Nobel Prize in physics that was awarded for it in 2010 (see www.nobelprize.org/prizes/physics/2010/press-release). Our guest then talked about R&D funding abroad and in the US. She told about the 1 Billion Euros by the Europeans in 2013 and the US graphene funding history which has declined over the years. The importance of government and agency funding was stressed, especially for the U.S. Zina mentioned problems associated with all sorts of graphene hype. This was interesting so make sure you hear her hype comments. Our guest was asked about current commercial graphene products. This led to a discussion about biosensors and biomedical equipment and information. Don't miss what she said about this and other fields of technology, including space. She talked about research centers such as Rice University and the Univ. of Texas, chemical and physical properties and future probable uses. A listener then asked about commercial graphene products today. Several examples were given including tennis rackets, tires, car bodies and concrete. I asked Zina about private R&D funding. There has been some private sector funding but most of the funding for research has been research. Charles from St. Louis asked about graphene in concrete. Zina described the two forms used for concrete and I brought up an example of the concrete roadway of a Bay Area bridge recently falling off in chunks with the blame going to corroded rebar. Don't miss what Zina said about the usage of graphene, anti-corrosion paint and the mixing of it in concrete for added strength and longer lasting than concrete with rebar. I asked about comparative costs for using graphene in concrete and construction. Don't miss her response to that question. In the second segment, we started to focus on space applications. NASA has shown an interest in the materials plus our guest mentioned many of the challenges. Thermal distribution was a benefit of graphene so again listen to what she said about graphene and high temperatures. She also talked about graphene for high energy capacity applications and shielding. 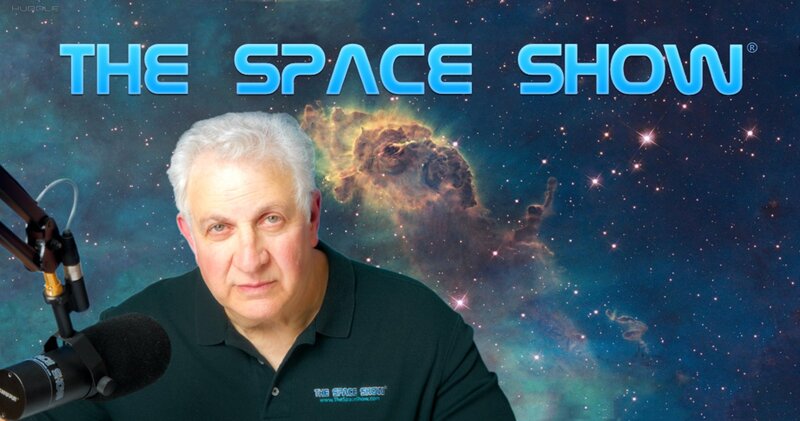 In addition to benefits in these areas, graphene remains light weight and incredibly strong which makes it useful for many space applications..
Listener Roger asked if graphene could be used in the interstellar chips being discussed by Breakthrough which we have talked about on many Space Show programs. I brought that discussion current and asked if an RFID chip could contain lots more capacity for data to be used in the space based whale tracking that we discussed on the recent Tuesday Space Show program. Several more email questions came in, one asking about propulsion. Zina brought using graphene for solar sales. Don't miss what she said about this and how it would work and benefit this type of propulsion. Next, Jack brought using graphene for reusable rocket parts so they could be stronger and lighter. Also, such parts need to survive extreme heat and temperature shifts, something graphene can easily handle. Before we ended our discussion, our guest was asked about her having talked to Musk, Bezos, ULA folks or others at SpaceX, Blue Origin, ULA and other commercial space companies. The answer was not yet but that was going to happen. Finally, BJohn wanted to know about using graphene in a fuel making process on say Mars. The answer was yes but make sure you listen to the actual question which I read on air and Zina's full answer. Other possible commercial company users were mentioned, then our guest concluded the discussion by talking about the upcoming Washington, DC conference on graphene in May. You can read about the conference and make plans to attend from their website. Please post your comments/questions on TSS website. You can reach Dr. Jarrahi-Cinker through me or the National Graphene Association website. In addition, she provided her email address on air near the end of our discussion.